Eric Mazur is a professor of physics at Harvard. Like many successful academics, he was trained to teach in the same way he learned — standing in front of a room filled with students and lecturing them on the fundamentals of Newtonian mechanics (among other things). If his course evaluations and lack of empty seats are an indication, Mazur is apparently quite good at this. “For a long time, I thought I was doing a really, really good job,” Mazur told NPR in a radio segment earlier this week. After encountering some articles by Arizona State physicist David Hestenes, he re-assessed his teaching philosophy. 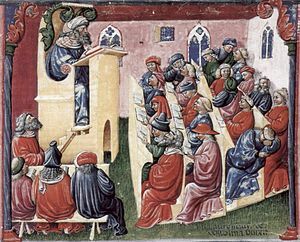 The lecture is an old form of education. In the days before printing, it arose as a means of mass producing books. One person would read a master copy, and others would write what they heard. In the digital age, however, we are a couple major technological paradigm shifts from that being an efficient way to disseminate information. Arguably, it was never the best way to learn. What Hestenes realized is that physics was being taught in a way that rewarded parroting formulas, not understanding concepts. Exams demanding qualitative analysis and application of physical laws of nature aren’t solved with a general formula unless the students understand what the calculus represents. Together with a colleague, Hestenes’ response to this insight was to develop a way to assess how well students understood conceptual physics: the Force Concept Inventory (PDF). The FCI focuses on the Newtonian concept of force, without which the rest of mechanics is meaningless. The example used in the NPR story was the problem of two same-sized objects of different weights falling from the same height. The possible answers favor the heavier or lighter object, or that they will both take the same time to fall. While the FCI is a way to measure the effectiveness of past instruction, it can also become an approach to teaching the concepts in the first place. For Mazur, his well-received teaching style demonstrated only a modest gain in understanding. His physics class has since changed, making the students debate as the primary means of learning. 100 students will break up into small groups to discuss questions like those posed in the FCI, using mobile tech to vote for an answer before and after they do so. Mazur noted that student understanding triples through this process, culminating in a “peer instruction” session to reinforce the reasons behind the answers. This re-working of traditional sage-on-the-stage education is a philosophy of education gaining some traction, thanks to open information platforms like YouTube. Khan Academy calls it flipping the classroom, where the information transfer takes place outside of school and working through the concepts together is the best use of time with instructors. Sitting passively in crowded classrooms has other consequences, too. Researchers in Amsterdam announced a significant positive relationship between physical activity and academic performance. While there appears to be some consensus among professors that lecturing isn’t effective, few are willing to innovate. Many are threatened by what modern technology might do to their job security. Mazur argues that educators need to realize their role in the classroom is changing for the better, from a source of information to a guide in how to use it. Listen to the full 7-minute segment on NPR. vía Vendedores boicotean a Amazon por sus bajos precios. La eterna lucha de precios entre grandes empresas y pequeños comercios locales, en versión gran almacén online.